Until very recently, Jocko Willink has led a very private life since returning from war. His leadership skills & implementation of leadership skills are 2nd to none, which is why companies & teams across the country contract he & Leif Babin. The video at the top of the page is from a TED Talk that Jocko gave in 2017. This story lays the foundation of the book. Note: I’m a big fan of audio books. It’s actually 1 of my secret weapons for getting through books a faster… hello 1.5x speed!!! I’d highly recommend you listen to this book. If you can’t tell from the video above, there is an intensity to both Jocko & Leif that comes through your headphones that you will love! When I’m reading any book on business or leadership I’m always thinking about how it might apply to a single prospect, a full team or a coaching staff. 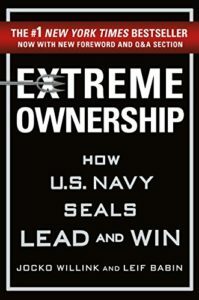 In short, I’d recommend “Extreme Ownership” to any player, team or coach. Extreme ownership means stepping up & taking responsibility for the good, the bad & the ugly. If you are the leader, you are ultimately responsible… responsible for everything! Period. While the book expands on a dozen different leadership lessons that can all be applied on the ball field, I’d like to highlight just a couple here. I’ve spoken in the past about the importance of a plan. They dedicate an entire chapter to the concept. I’ll pull out an excerpt that you should print & post in the locker room for all to see. • Analyze the mission. —Understand higher headquarters’ mission, Commander’s Intent, and endstate (the goal). —Identify and state your own Commander’s Intent and endstate for the specific mission. • Identify personnel, assets, resources, and time available. analyse possible courses of action. course of action. —Focus efforts on the best course of action. • Empower key leaders to develop the plan for the selected course of action. • Plan for likely contingencies through each phase of the operation. • Mitigate risks that can be controlled as much as possible. it still fits the situation. The final chapter is called “Discipline Equals Freedom” (side note, that’s the name of Jocko’s newest book… get that too!). In this chapter, Jocko lays out what he describes as the “Dichotomy of Leadership” which made me think about current & past leaders that I’ve been around. The best leaders have all shown many if not all of these characteristics. close with troops but not so close that one becomes more important than another or more important than the good of the team; not so close that they forget who is in charge. able to execute Extreme Ownership, while exercising Decentralized Command. Surround yourself with teammates that sound like that list and you are well on your way to victory. I hope you enjoy this book. Put Yourself in The Best Position Possible To Succeed at Fulfilling Your Dreams.